Britain can block immigration and allow its economy to contract by £56 billion or broker a new agreement with Brussels that would see the continued free flow of Europeans through its borders, a leading think tank says. In a direct challenge to UKIP leader Nigel Farage, who has long argued that Britain can prosper outside the EU by blocking immigration, think tank Open Europe warned a unilateral exit from the EU could spark a permanent 2.23 percent contraction of the UK’s GDP by 2030. This amounts to £56 billion per annum. Following the release of its report, Director of Open Europe Mats Persson said Farage and his party have some important questions to answer. Addressing Farage directly, Persson asked the UKIP leader precisely what his vision of a profitable Brexit entails. “Is it the free trading Hong Kong-Britain with very liberal policies, including on migration, which is what is needed to make us competitive? “Or is it what probably most of what your voters want: to shut the borders and shut the world out which would mean a net loss in terms of the UK’s GDP and economic competitiveness?” he asked. Open Europe advocates for wide-scale liberalizing reforms of the European Union. Its research, published on Monday, analyzed Britain’s options with respect to a possible EU exit in 2017. The think tank concluded negotiating an exit from the union would be so arduous for Britain that working to secure improved membership terms would be more constructive. The think tank’s findings support PM David Cameron’s perspective, who says Britain should remain in a reformed EU. Concerns over a possible Brexit (British exit from the EU) have been the source of heated debate in recent months. 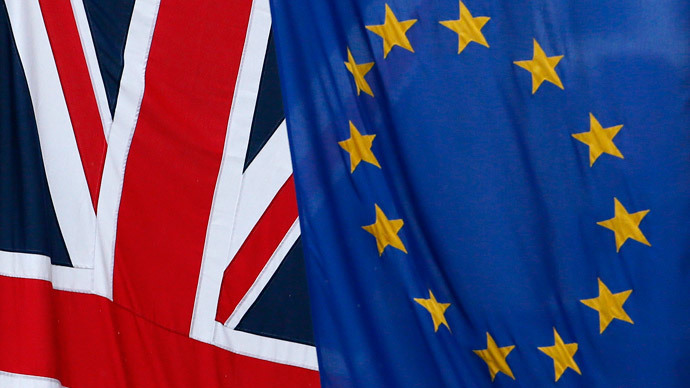 A Conservative-backed EU referendum is pledged to occur on the issue in 2017. Open Europe’s study, ‘What If,’ examined four potential scenarios associated with a Brexit. The think tank ranked its findings in terms of best-case and worth-case scenarios. The worst form of Brexit would be Britain’s departure from the EU customs union and single market in the absence of a trade deal with the bloc’s member states, the think tank said. This move would create extra tariffs at the bloc’s ‘hard border’, resulting in an additional 10 percent on car exports to the EU. Britain’s financial services industry would also be heavily impacted, with severed access to the EU, Open Europe argued. He warned this could occur if Britain left on “very hostile terms” and a breakdown in negotiations ensued. He noted this route would also likely be accompanied by a 2.23 percent dent in UK GDP. A somewhat improved Brexit scenario would entail a free trade agreement with EU member states, Open Europe claimed. The think tank suggested this would mark an improved version of Switzerland’s relationship with the EU. Central to this deal, would be for Britain’s trading relations with foreign states to remain intact. However, a 0.81 percent contraction in GDP would still be likely, Open Europe said. A slightly more beneficial policy route would see Britain scrap multiple EU regulations and bring in “unilateral free trade” whereby the UK could open its borders to foreign competition, Open Europe said. It predicted such a move would culminate in a 0.64 percent increase in UK GDP each year. The best outcome, according to the report, would be for Britain to secure a deal with the EU, put in force a unilateral free trade deal and opt for maximum deregulation on EU rules. This would pave the way for Britain to scrap the EU’s targets on climate change and would result in an overall 1.55 percent increase in the UK’s GDP, the group said. Britain’s potential exit from the EU relates directly to the Lisbon Treaty, an international agreement ratified in 2009. At the time of the treaty’s implementation, critics across the continent warned it would lead to the creation of a European super-state, characterized by powerful, unelected bureaucrats. Those who backed it, however, said it would help to carve a path forward for the EU. If Britons take inspiration from the deals sought by Switzerland, continued unrestricted EU migration would likely be central to any Brexit deal, Open Europe says. The findings of its report pose a direct challenge to UKIP leader Nigel Farage, who has long argued leaving the EU could be profitable for Britons as long as the UK blocks immigration. On Monday, Farage said immigration matters more than Britain’s economy. The UKIP leader is yet to clarify, however, whether a dramatic contraction of GDP is something Britain should sacrifice in the wake of a Brexit.